FATHER MAXIMOS (Constas) appeared on CBS's 60 Minutes Mount Athos program. 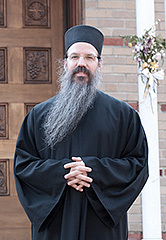 He is a native New Yorker, and a graduate of Hellenic College and Holy Cross Greek Orthodox School of Theology. He holds a Ph.D. in patristics, has twice been a fellow at Dumbarton Oaks, and for many years was a professor at Holy Cross and subsequently at Harvard Divinity School. The author of many scholarly books, articles, and translations, his edition and translation of St. Maximos the Confessor's Ambigua was published later by Harvard University Press. He is currently a visiting professor at Hellenic College and Holy Cross.